Also available on Kindle and Nook. Old legends tell of a powerful witch who lived and taught in 14th century Italy. She was known as Aradia, and by the titles The Beautiful Pilgrim, and The Holy Strega. But was Aradia a real person, and is there any true basis for her legends? Pagan scholar Raven Grimassi explores this and many other questions in this new revised edition (greatly expanded from the 1981 published version of The Book of the Holy Strega). 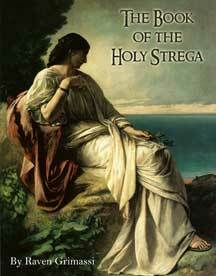 The Book of the Holy Strega is a seminal work that brings together historical and folkloric sources. Grimassi delivers a ground-breaking view of the misconceptions of "historical witchcraft” and presents a refreshing approach to understanding how fantasy became regarded as fact. Revealed in this one volume is the role of the Church in distorting witchcraft and promoting its contrived vision for political purposes. Discover the truth about the denied culture of the witch. Examine the elements that joined together to form the witches’ gospel. The journey of exploration in the sub-culture of the witch is well guided in this pioneering text. Grimassi reveals his own hand in assembling the published versions of the Book of the Holy Strega, and he provides the reader with an overview of the evolution of these writings. Here you will see the gospel of the witches through the eyes of those who have honored it in the past, and how it continues to speak to each new generation.